Well, the final chapter of Coming Home has been extremely slow-going. This was mostly because I found it hard to block out dedicated time to finish the final chapter – I haven’t been working weekends so I’ve literally only had a few hours here and there to spend on Coming Home. And I think I almost collapsed in a heap after making the first 11 deadlines (for the first 11 chapters)! However, I’ve finally finished, finally written “THE END” in bold capital letters on the last page. Phew! Now it’s time to start the editorial process – first me, then a professional editor. I’m also investigating cover design and page layout templates/software programs. This stuff is usually organised by my publishers, so it’s all new for me and a little overwhelming. I am getting there, but the final PDF definitely won’t be available on the original ‘advertised’ date of 2 April. I’ve revised the schedule to 10 May. Apologies to everyone who’s anxiously waiting to find out whodunit. In the past couple of weeks I’ve also been working on US edits for Kiss of Death, which is due out in North America on 1 August – only fours months to go! These edits are generally minor things, although they are more significant than just changing colour to color and organisation to organization. Different editors will invariably pick up different things and so my US editors have pointed out some minor mistakes (like getting a day wrong), made suggested cuts throughout plus earmarked a few queries that have led to small additions on my part. I’ve actioned all of these and now have the final page proofs sitting in my inbox for review. That’s my task for this week, before editing Coming Home. Thanks again to everyone who voted and took part in Coming Home. It’s been an intense ride and I hope you’ve enjoyed it! Okay…so I’m nearly finished the online experiment that is Coming Home – and book 6 in the Sophie Anderson series. This week is officially the last week of my interactive ebook – i.e. I’m working on the last chapter, although I’ve got a sneaking suspicion I may need an extra chapter or a epilogue. However, I haven’t started working on the last chapter yet and I’m considering NOT posting it on Monday. It’s a long weekend here in Melbourne and I really want the full weekend off! I’m thinking it may create much better dramatic tension to hold off on posting the final piece of the puzzle/case. Then I can write the final few pages after editing what I’ve written so far – and I’ll be coming from a better place editorially speaking. What do you think? Would you kill me? Send me an email at info@pdmartin.com.au or comment below! And as they say…speak now or forever hold your peace. Well, it’s been a while since my last blog…instead of blogging I’ve been enjoying the Aussie summer. My husband, daughter and I were at the beach for January. Most days were simple: a walk, coffee, playground, relax a little at the house, then a trip to the beach with lots of swimming and sand-castle building (actually, I mostly watched my husband and three year old build the castles). Nights were generally DVDs – Dexter and Breaking Bad, plus several movies. Sound good? It was! 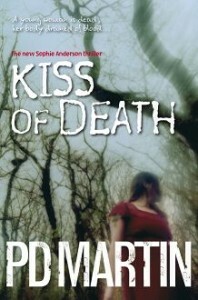 The only drawback was that I did get behind on emails, blogging, and other stuff, and had to take breaks to promote Kiss of Death, which was released in Australia and New Zealand 1 January. Of course, I’ve also been working on Coming Home (www.pdmartin.com.au/ebook), writing one chapter a week. It’s hard to believe I’m now officially over half way through this process. I never know when a book will end when I’m writing it, but at the moment it doesn’t feel over halfway done. However, I’m hoping it is because I kinda need to stick to the 12-week, 12-chapter plan. Mostly because I‘ve started my new project and really need to focus on getting the proposal and first three chapters to my publishers. After all, with summer almost over it’s time to get another paying gig Fingers crossed my publishers will like the new book…it‘s not an ebook or a Sophie book!!! Shock, horror. It’s been really exciting working on it this past week. 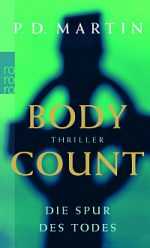 For a start it’s written in third person, and it’s much, much darker than Sophie. A deeper exploration of Sophie’s emotional state – she’s investigating her own brother’s murder and at the moment I don’t think that character crisis is coming through enough. Excerpts from a new victim’s POV – I’ve started adding these in, but will need more. Sophie’s gift – seven chapters in and only one vision/nightmare. Even though they’re not the focus of Sophie books, I think I probably need more. General tweaking, including working on the writing style and word choice for a better read. I always do a lot of editing between the first draft and the final draft, so you can expect changes from what you’re reading now and what you’ll read in the final PDF of Coming Home (available two months after I finish the last chapter). So, I’m off to work on the new book (really need to submit it) and chapter 8 of Coming Home. Wish me luck! This week’s blog is a little late – but the timing ties in nicely with the work I’ve been doing this week on Chapter 4 of Coming Home. I’ve just finished it! As you probably know, Coming Home is book 6 in the Sophie series, and I’m writing it online as an interactive ebook. I now post each chapter online on Monday morning (Aussie time), along with the questions for the next chapter. At the end of the 12 weeks I’ll edit the book in its entirety and re-launch it as a free ebook. There could be major edits, major changes! Given I’m posting each chapter online now, I don’t think I’ll be running my weekly ‘sneak peek’ competitions anymore. They seem a little redundant…what do you think? Write a comment below this post or email me if you have any suggestions. The new procedure of posting the book chapter-by-chapter has some challenges for me. Already this week I can see edits and changes I’ll need to make. For example, I’ve drafted Chapter 4 with Sophie looking at the most recent victim’s skeletal remains. But I think I may end up having to make the body ‘fresher’ to fit in with other elements of the case and give the detectives and Sophie. What this means is that when you read Chapter 4 this week Sophie’s looking at a skeleton of a boy who was killed six months ago, but when I release the final book this may change! My other challenge at the moment is that I’m away at the beach, spending 90% of my time on holiday with my husband and three-year-old daughter and 10% of my time writing. I also don’t have Internet down here (except for an hour or two in the local library a few times a week), which means I don’t have access to my usual research materials – being able to email a forensic pathologist while I’m writing and getting an answer back within a few hours or a day, looking up my extensive book collection or spending an hour or two searching for body decomposition states after 6 months in bushland (and whether six months’ decomp is more forensic pathologist or anthropologist). Just your average crime author research! This may mean even more edits in a few weeks’ time when I’m back into my normal routine. Aside from that, I’m really enjoying writing Coming Home and being in Sophie’s head again. You guys are deciding Sophie’s fate. That’s right, you get to vote for what’s going to happen in each chapter of my next book. Ahhhh!!! Who is our main character and what are they like? These are massive decisions, plus along the way an author is constantly deciding what will happen next, how the crime will be solved, what clues will be left and how the main character will develop. This week I launched Coming Home – I describe it as an interactive ebook, in which participants get to have their say in the plot and characters. And it’s extremely scary for me that these decisions are largely out of my hands. Sure, I nominate the options, but ultimately you decide. It was less than 48 hours ago that I “launched” and I’ve found myself constantly clicking on the “show results” section for each of the initial two questions. I have my favourite/s, of course, but majority will rule. You vote, I write it. I’m a slave to your whims! And I’ve already had one suggestion for a future question: “Vote for lesbian love scene” Yes or No? As you may have guessed, this was suggested by a man! Anyway, this is a scary process for me and I’ll probably blog about my progress each week. Who knows how the book will unfold. I can tell you this: I haven’t planned any follow-on chapters/options/questions. I have NO idea where this is going. No wonder I’m quaking in my boots.